"Fake it till you make it!" "Don't quit five minutes before the miracle!" Get active and get specific. Magic is a precision science so getting specific in what we "do" can move us closer to manifesting what we want. And being active (translation: staying busy until the Universe manifests what we want) makes us feel better ... we like feeling like we are useful, productive, and essential in our manifestation. Trusting the Universe is just way too simple, sometimes! So how do we get more active and specific in a way that doesn't interfere with the workings of the Universe? We have to translate those generalized slogans into specific actions that we can perform. For instance, consider the slogan "Act as if you already have what you want." Suppose you really want to take a trip to a sunny beach on another continent, but your bank account isn't even covering your bills. So you tell the Universe that you want to take this great beach vacation, the dates you want to go on this vacation, and the details of the vacation (like length of trip, how much spendable money, first class airfare, and so on). Now the Universe knows what you want, and the wheels are already spinning to manifest what you want. Whew! That part is done. Now what do you do with yourself in the meantime? You get busy with actions that don't negatively affect your bank account and help you act "as if." One woman helped herself co-create just this kind of vacation by keeping herself busy. She took lots of actions, but the one that started the whole process was this act: she packed her bags for her trip! Did she have her airline ticket yet? No. Did she have any money for any part of the trip yet? Nope. She had absolutely no physical evidence that her great vacation was going to happen. What she did have was a suitcase and plenty of beachy clothes. So she packed her bags. She found out the luggage requirements for her trip, then filled her suitcase. Clothes, sunscreen, toothpaste, a couple of novels, sandals, and even a waterproof money-holder went into the suitcase. 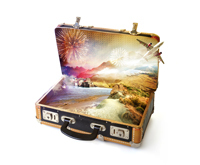 When she had finished packing her suitcase, she felt a deep sense of satisfaction -- which helped the Universe manifest her dream vacation even faster. After she packed her bags, she continued her specific actions of "acting as if" she already had her vacation paid for. She lost weight and improved her body in preparation for showing off in a bikini. She got postal forms to stop her mail during her vacation. She gathered all relevant paperwork and potential travel documents into a folder. This woman had a great time acting as if she already had her vacation paid for, and the Universe complied with an unexpected windfall that allowed this woman to pay for every aspect of her dream trip. What this woman did NOT do was to take any actions that could be interpreted as "working toward" her dream vacation. She didn't take a second job to earn money for her trip. She didn't sell a bunch of her stuff to get money for her trip. She didn't marry a rich man so she could take a trip. These are all viable ways to get your dream vacation. It's just that these actions mean that YOU are working on your vacation instead of allowing the Universe to bring it to you magically. "Do I want this to happen by magic or by blood, sweat, and tears?" If you want the magic in your life, then take specific actions that you will have to take anyway when your dream manifests. Do NOT take actions that you would normally take if magic didn't exist. In other words, "pack your bags!"